The dust had barely settled on the last freshman’s departure for the summer when Drexel’s dining centers decided to trim their services to the bare minimum, effectively leaving the remaining upperclassmen who have paid for this service in limbo about their next meal. Northside Dining Terrace and the Handschumacher Dining Center closed for renovations, and several other student eateries cut their hours. Shortly after, Drexel Campus Dining sent out an email advertising its summer meal plans — completely glossing over the fact that most campus dining locations are closed by the time the dinner bell sounds. How can Drexel ask students to purchase meal plans that can only be used at increasingly limited locations for few hours out of the day? Drexel’s first plan listed in the email, and presumably the one it wants to push most prominently, is the “Combo 50” plan, which offers $250 dining dollars and 50 meal swipes for the term for the cost of $785 — if you take out the $250 you “get back” in dining dollars, that’s a cost of $10.70 per meal swipe. And if you figure one term is roughly 70 days, that gives you a whopping $3.57 per day in dining dollars. 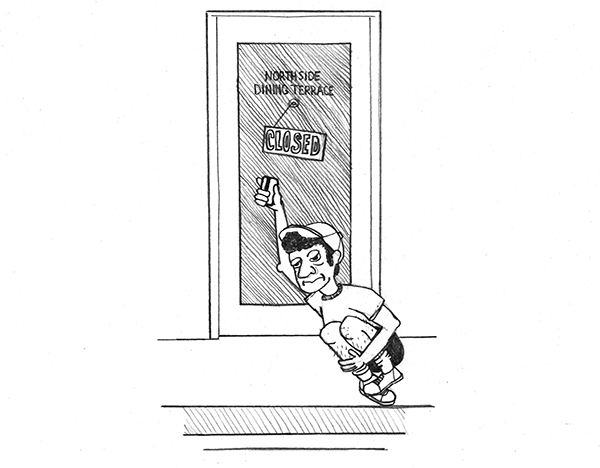 While you won’t find an easily-accessible list of eateries’ hours online, there is one posted on the doors of Northside Dining Terrace. In Northside, Chick-fil-A, AFC Sushi, Subway and The Market are all closed for the summer. For those meal swipes, the Handschumacher Dining Center is undergoing renovations and two out of the seven dining options within Urban Eatery, SoLA Deli and Street Fare, are closed. Even the kosher “The Cafe” in the Perelman Center for Jewish Life is closed for the summer. That leaves Starbucks and ThirtyOne41 as the only locations on campus outside of Urban Eatery that accept dining dollars. Furthermore, every station in Urban Eatery closes by 7 p.m. That’s before dinner time for many students taking late classes. With the high cost of a meal plan and the extremely limited dining options it offers, we have to wonder how Drexel expects any sane student to consider purchasing one. Does Drexel really think that prepaying for $785 worth of breakfast, lunch and coffee is a valuable service to students? For the kind of money you’ll spend on a meal plan, you could easily choose to eat at any independent eatery near campus or buy groceries and make your own food. And with how early the dining options close, you’re going to have to do that anyway if you’d like to eat dinner. If Drexel wants to sell more meal plans, it’s going to have to take a hard look at the offerings. A few retail locations here and there just isn’t going to cut it. Drexel keeps bringing in stores like Saxbys and Wawa, which is great, but if they’re not going to honor student meal plans they’re no more valuable to the student body than any other eatery in Philadelphia.